...lies my e-book cover revealed! As you can see my story is called "Dancing in the Shadows of Love". I even have an ISBN number for it, which is so exciting! 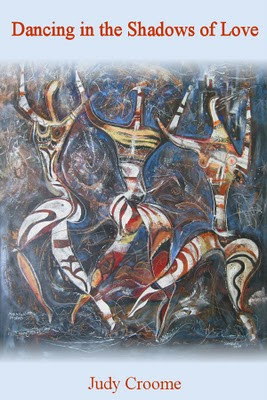 The painting is in the style of the rock art of the ancient San people of Southern Africa, dancing as they celebrate the blessings of the divine being and their ancestral spirits. In a break from my normal blogging routine, on Thursday I'll post a conversation I had with Wenkidu explaining the layers of symbolism in the painting. As Dancing in The Shadows of Love is the story of three women and their search for divine love, you'll see why this image struck me as perfect. Joleene Naylor kindly did the cover design for me - her patience with my numerous changes is appreciated! So, what do you think of the cover? Knowing hardly anything about the novel, does it make you feel good, bad or indifferent? Congratulations Judy, this is so exciting. I love the cover and on technicality, if invokes curiosity, there is mystery, there is something ancient. I think it is perfect too. Oh Judy, Judy, Judy! It's BEAUTIFUL! I wanna a copy. Looking at this cover makes me want to read the book! I can't wait to get my hands on my copy, which I shall purchase the moment it becomes available. It's thrilling, clandestine, and downright magnificent. Christopher LOVES it! He wonders if the images on the cover stand for the three women. He thinks it is timeless. It really is beautiful. Very African, full of life and movement. Lovely. It looks very mysterious and ancient. Full of color and intrigue, totally like a painting one would find in the African section at an art gallery. I love it!Congratulations on putting it all together! That is a fabulous cover. It's gorgeous. It evokes all kinds of questions and emotions. Congratulations. Great cover, very African and definitely fits the title! Wow. That's almost all I can say. Wow. What an astounding painting. I love that are able to use it as a cover. Smashing! And it would draw me to discover what is within the covers of that book, yes, indeed. 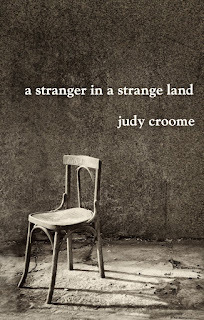 Judy, your cover is stunning and so very spot on for this great story. I think I may be as excited as you are about this release, I just can't wait! Your evokes the same kind of feeling I get upon looking at the cave drawings of the Australian Aborigines or the cliff paintings of the Native Americans. A fluid, haunting style that springs from our collective unconscious, born of awe and love. Judy, I'm so happy for you. Congratulations! I like your cover. At first, I didn't notice the bottom because the blog background is so light. But, after I looked at it longer, it all came together. Judy, this is so exciting! It's a very passionate piece of artwork. I love it for the cover, even if I don't know what the story is about. Oh Judy, this is wonderful! I love it! It really conveys a strong feeling. I can't wait to read the book. How cool is that?! I love the cover -- and the title! -- and am really drawn to the energy of the artwork. Congrats, Judy!!! The cover is stunning. It's hard to stop looking at it. wow! LOVE IT! LOVE IT! LOVE IT! Can you tell that I'm excited for you??? Very cool. Hi, Judy! What a gorgeous cover. And your title bar. Love the leopard! Thanks for dropping by the Cheetah (thanks for putting me over 100)!!! Wow! I love it! It's simple and complex at the same time. It's just lovely. Congrats on finishing! This is spirit lifting, there's a certain joy in just looking at it, absorbing it into oneself. Congratulations on the new book and on this cover. I wish you much success and sales to the stars. I love that cover. Very artsy. Congrats!!! What a wonderful book cover! OCEAN GIRL: For the story it really is perfect, but I was worried that to a completely new eye it would just be fussy, but if it invokes curiosity then that’s good! Right? ROBYN: That’s exactly what I wanted to hear, Robyn! Hoping for early May release. Tell Christopher he’ll find out what those three figures are on Thursday – the artist explains them! Hugs to both of you and hope you’re feeling better soon! 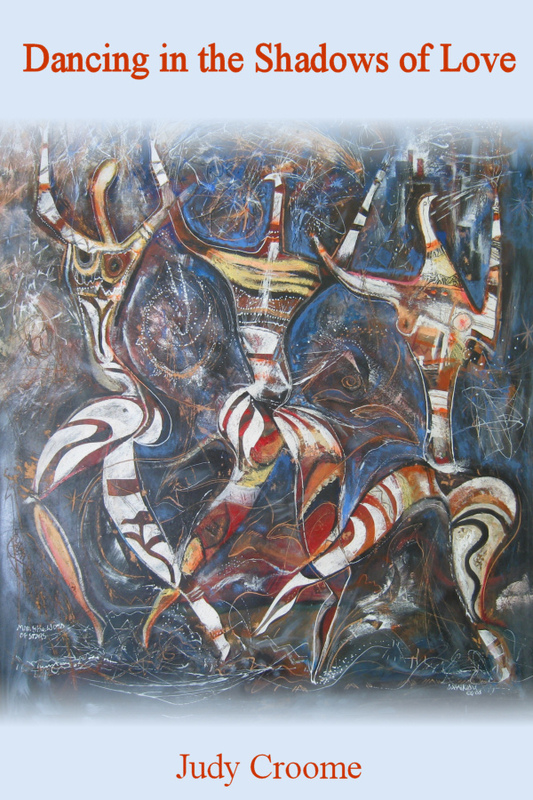 FRANCES: A good way of putting it Frances, it’s a lively painting – the colours as well as the dancing forms give it such energy. HELEN: Thanks! The photo doesn’t do it justice, it deadens the blue and orange, which s a very harmonious combination (they opposites on the chakra colour wheel). Thursday I’m posting a chat with the artist – he may answer some of those questions! TALEI: Welcome to the blog! And thanks for adding your voice; I’m glad you think the art work suits the title! JUDITH: The cover left you speechless with WOW!! That makes me happy!! ROLAND: Husband and I recently watched a BBC DVD on ancient civilisations and their connections – the South African San, Australian Aboriginal and Native American rock/cave paintings just emphasised the “oneness” of beings. The one connection that wasn’t mentioned in this programme was the suggested connection between the ancient Japanese and the Zuni tribe – that would have been extremely interesting to watch. If you can, try to pop in Thursday afternoon – the artist is a Rosicrucian priest, and his interpretation of the painting is interesting. DOMEY: Thanks so much Domey! This photo seems to fade a lot at the bottom, don’y know why…maybe it’s because it’s low res. Hopefully the problem will be sorted with the real cover, otherwise I’ll be stressing even more! JB: Yes, it is passionate, isn’t it? 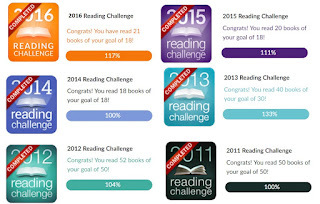 And it’s exciting but also nerve wracking – as Michelle said on her blog this self-publishing is really a challenge. But I’m enjoying it! NANCY: Yikes! Hope the book lives up to your expectations, Nancy! MARILYN: Very cool, Marilyn!! I’m so glad to hear that the holistic effect of the title/cover/art draws you. KELLY: Excited? Nah! I’d never have guessed it!! Thanks Kelly! MARIE: Welcome to the blog! And thanks for the follow. The artist who did the leopard in my title bar specialises in the big cats. His work is brilliant! As you’re also (clearly!) a feline lover, it’s worth scrolling down my side bar on the right hand side to the widget that says “original art by Fuz Caforio” scroll & click and you’ll go to his web page – he has such beautiful animal paintings. He did a polar bear for husband which you can see on husband’s blog (on my links page). MICHELLE: Much like my novel then (simple and complex at the same time)!! Thanks for all your advice along the way – so appreciated! MELISSA: Welcome to the blog and I hope that my book can make you feel what this cover did: uplifted and joyous! And “sales to the stars” sounds good! If you can, you may find it interesting to pop back in on Thursday to read the artist’s interpretation of the novel. SUN SINGER: Lovely to see you again! And thanks, I’m glad you like the cover! Love the cover AND the title of your book. The cover helps me connect to the title well without giving away much about the story. I makes me want to open the book. Very well done. GLYNIS: It's good to know that the title and the cover tie in! I've been busy with my book trailer (which is why I'm behind on blogging!) and hope that will entice the reader even more! Hi Judy .. love the look before you even started the post - it's a stunning picture .. lucky you that your dear hubby bought & then Martin let you use it for the cover of your book. The music is beautiful too - all so resonant of Africa ..
Love the video you put together - clever .. but everything seems to be slotting into place - you must be delighted and May isn't far away .. I'm looking forward to reading your interview too .. it's up I see .. the book trailer is excellent ..
HILARY: So glad the cover drew you before you'd even read the post! And that you like teh book trailer - it was such fun creating it! I felt like a movie director!! :) Getting nervous about the release as well...the moment of truth about my book is getting closer and closer! Gulp. And hope you have a great day and week as well. FAB trailer for Shadows: perfect for the book! Can't wait to see it up in lights in May! I've also just gone and read your short story (Heroes Day) and it was superb - well done!! LEONIE: Thanks - May is so close now, getting nervous!! And thanks for all your input into the book, the cover and the trailer - couldn't have got it this far without my crit-buddies! :) Glad you enjoyed "Heroes Day"